As a fifth generation Texan, Steve's roots to the land run deep...some of his fondest memories involve bird hunting with his dad, working cattle, riding around looking at ranches, or listening to stories about Texas history and lore. Steve's love of the Texas landscape was crafted out of the wild scenery of West & North Texas chasing quail, dove, and ducks...his wife will attest that those interests have been expanded to include whitetail deer and turkeys. The common denominator has always been a deep & abiding appreciation for the land...Texas land. After graduating from Baylor University with B.B.A., Steve was blessed to marry his college sweetheart, Shawn, and they have three sons Cade, Drew, and Jake. Aside from work, his time is invested in church/men's ministry, hunting,, and time with his bride. 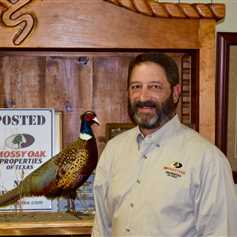 Steve joined with his two partners to establish the Mossy Oak Properties franchise in Texas building a growing network of affiliated offices.